The Florida panther is the Sunshine State’s animal, and it’s also in trouble. PALM BEACH COUNTY, Fla. — The Florida panther is the Sunshine State’s animal, and it’s also in trouble. For those that are left, the places where panthers can live are diminishing. In Loxahatchee Groves, Sadie Ryan at the Panther Ridge Conservation Center keeps an eye on a number of species before the center opens back up soon. That includes the one we see on the some of our license plates. Ryan showed WPTV one of their two panthers at the center. "Living with us for seven years," Ryan said, who added the Florida panther is dealing with a lot these days. "30 a year get killed in automobile incidents," said Ryan. "We’re just encroaching on their habitat." Judy Berens, Executive Director of the Panther Ridge Conservation Center, said the panther doesn’t have enough space because of development. 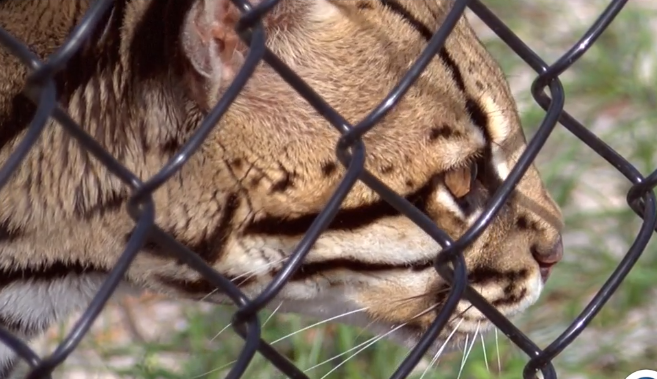 Figures from the Florida Fish and Wildlife Conservation Commission show there are roughly 200 to 230 left in the wild and confined to a small space in Southwest Florida. "They’re having trouble fighting amongst themselves for food," said Berens. At Zoo Miami, Ron Magill said a lot needs to be done to help the Florida icon. "These animals need to have those unobstructed areas where they can move back and forth," said Magill. "That’s the problem. They need large territory to survive." Magill mentioned more territory north and south of the Caloosahatchee River. Both he, Ryan, and Berens agreed this is a discussion that needs to be had to protect this piece of our paradise. "Panthers were always part of it," said Berens. "Should always be a part of it."